The mendicant orders, Franciscans and Dominicans, had come to Mexico with the intention of building the Kingdom of God on earth. Here in the New World, they thought, Christianity could be recut from the original template, with none of the failings it had suffered in the Old. Men with such a mentality were of course quite unmoved by pleas for religious tolerance. 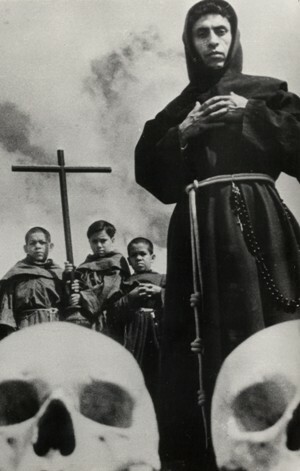 The friars drove the Mexican priests from their temples and began the first battle against the devil and the diabolical religions. 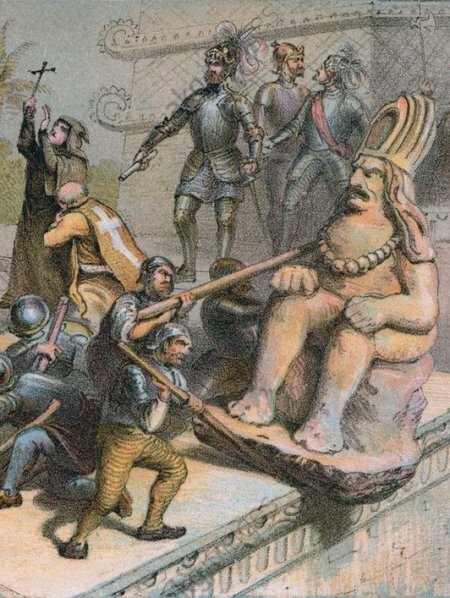 The ultimate mendicant objective was a separate Indian realm –a república de indios- organized along quasi-medieval corporatist lines, under theocratic rule sanctioned by the Crown, a realm from which Spaniards and Spanish ways would be paternalistically excluded. But it is certain, too, that mendicant rule displayed less benevolent features in practice. 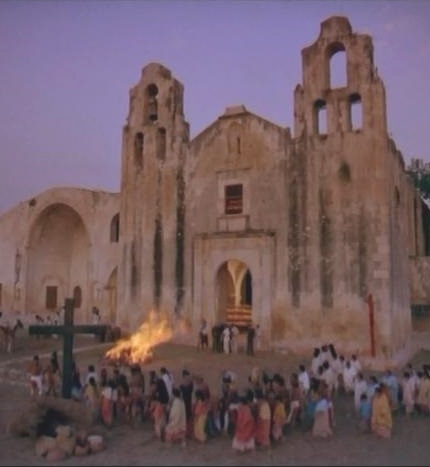 Corporal punishment was used to discipline the new Indian converts, and in Yucatán, Diego de Landa, provincial of the Franciscans, institute a reign of terror against Maya idolatrers in the 1560s. Forced conversions. 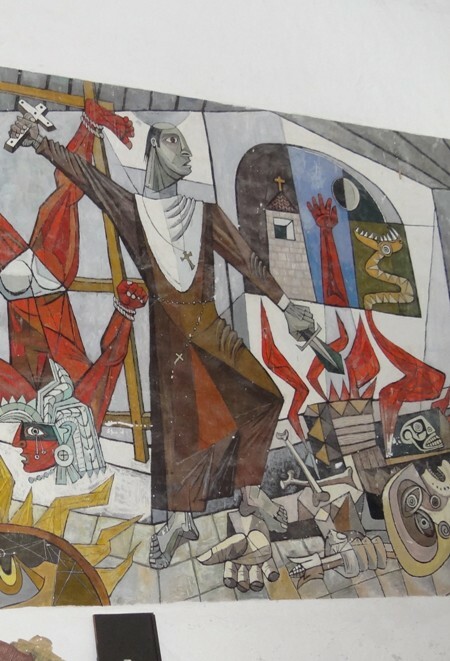 Chetumal, Mural in the Congres of Quintana Roo, author Elio Carmichael, "Forma, color e historia de Quintana Roo." Letter of Francisco de Montejo Xiu, Governor of Maní, and other prominent town governors, to the King, April 12, 1567. "After we learned the good, in knowing God our Lord as the only true god, leaving our blindness and idolatries, and your majesty as temporal lord, before we could well open our eyes to the one and the other, there came upon us a persecution of the worst that can be imagined; and it was in the year ’62, on the part of the Franciscan religious, who had taken us to teach the doctrine, instead of which they began to torment us, hanging us by the hands and whipping us cruelly, hanging weights of stone on our feet, torturing many of us on a windlass, giving the torture of the water, from which many died or were maimed. "Being in these tribulations and burdens, trusting in your majesty's Justice to hear and defend us, there came the Dr. Quijada to aid our tormentors, saying that we were idolaters and sacrificers of men, and many other things against all truth, which we never committed during our time of blindness and infidelity. And as we see ourselves maimed by cruel tortures, many dead of them, robbed of our property, and yet more, seeing disinterred the bones of our baptised ones, who had died as Christians, we came to despair. 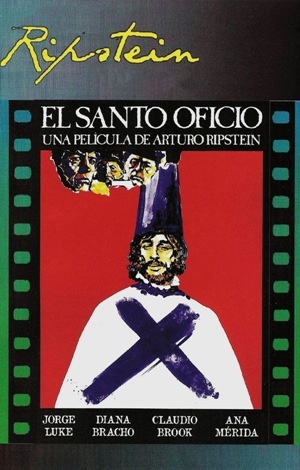 "The religious of San Francisco of this province have written certain letters to your majesty and to the general of the order, in praise of fray Diego de Landa and his other companions, who were those who tortured, killed and put us to scandal; and they gave certain letters written in the Castilian language to certain Indians of their familiars, and thus they signed them and sent them to your majesty. May your majesty understand that they are not ours, we who are chiefs of this land, and who did not have to write lies nor falsehoods nor contradictions. May fray Diego de Landa and his companions suffer the penance for the evils they have done to us, and may our descendants to the fourth generation be recompensed the great persecution that came on us. "May God guard your majesty for many years in his sacred service and for our good and protection. From Yucatan, the 12 of April, 1567. "Your majesty's humble vassals kiss your royal hands and feet." Statue of Nachi Cocom, lord of Sotuta (Maya new year day, july, 26, 2015). 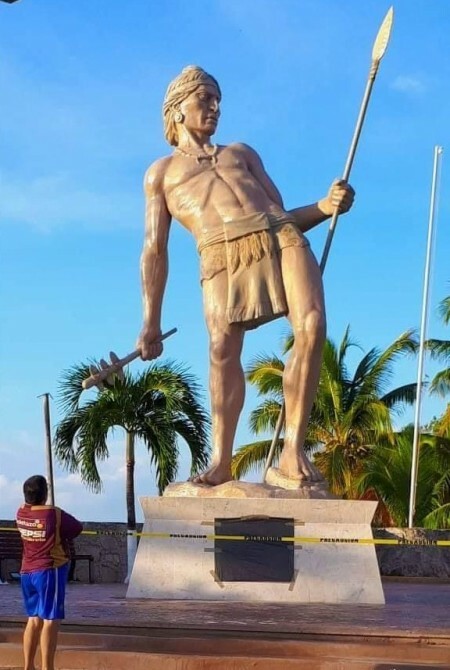 Nachi Cocom was the last independant Maya king of the state of Sotuta in Yucatan. 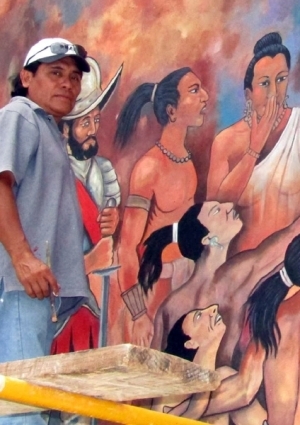 After the conquest, he befriended Diego de Landa and served as one of his informants on Maya culture. "he said that in so far as His Grace being in this village and province punishing the idolatries which have been and are now in it, he has been informed and thus it is that among the chiefs and principales of the said village and province and the rest of the common people there have been great sacrifices and heresies within the churches, and not fearing the fear of God our Lord, holding as they have held for little the things of our Holy Catholic Faith, they have gone against it preaching within the churches the false sect of the devil and things of idolatries as they were used and accustomed to do in the time of their heathen past, bringing to the church for the said preaching the idols and devils they have, that they adore and have adored until now, and besides this they have brought back and perverted the rest who already have and who will come to the said idolatries, threatening the masters and boys of the school and forcing them to consent without delay to the performance of the said sacrifices and ceremonies within the church. And that besides this the principal lords and ah-kines and schoolmasters have made human sacrifices to god [sic] within the church of this village and in other places in homage to the devils, killing infants and boys and girls, Indian men and women, offering the hearts ripped living from them to the devils. And likewise they have made many other idolatries and ceremonies in accordance with their ancient customs and have burnt crosses, taken from the altar to burn them, mocking them, holding them in little account, and holding in little account the preachings of the religious, and they themselves have become priests, and have preached falsely, claiming that which the priests, friars and clerics were teaching them was not true or good, and that they [the ah-kines] were telling them were things for their salvation and that by doing that which they were advising, sacrificing, worshipping and venerating the idols and devils, they will be saved. "En el caso, que como no hay hombre docto destos padres ni menos conocen a indios ni tienen caridad ni amor de Dios para sobrellevar sus miserias y flaquezas, por no sé qué flaquezas que entreoyeron de que algunos dellos se volvía a sus ritos antiguos e idolatrías, sin más averiguaciones ni probanzas comienzan a atormentar a los indios, colgándolos en sogas, altos del suelo y poniéndoles a algunos grandes piedras a los pies y a otros echando cera ardiendo en las barrigas y azotándolos bravamente. "Y por las confesiones así hechas, luego los condenaban estos padres a tantos reales de pena y se la llevaban, y a tantos azotes, y se los daban, y a obras de servicio en casas de españoles. "Fray Diego de Landa, contradictorio provincial de hierro fanatico, destructor e incansable constructor, luz y sombra. Persiguió a los Mayas como inquisidor. Como obispo los defendió de los encomenderos. Hizo el auto de fe de Maní y la "relación de las cosas de Yucatán". Historiador primordial, es figura eminente en la segunda mitad del siglo XVI. 1971. Carlos Loret de Mola Mediz. 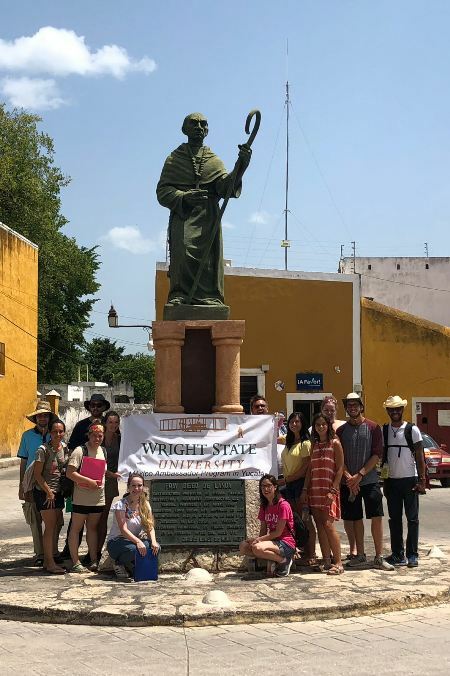 [Yucatan governor, 1970-1976]"
"After the people had been thus instructed in religion, and the youths benefited as we have said, they were perverted by their priests and chiefs to return to their idolatry; this they did, making sacrifices not only by incense, but also of human blood. 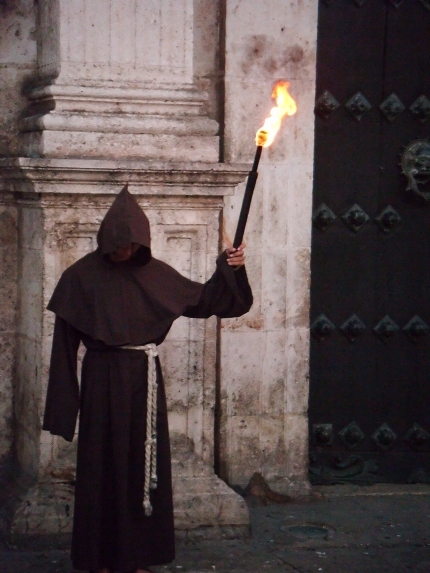 Upon this the friars held an Inquisition, calling upon the Alcalde Mayor for aid; they held trials and celebrated an Auto, putting many on scaffolds, capped, shorn and beaten, and some in the penitential robes for a time. Some of the Indians out of grief, and deluded by the devil, hung themselves; but generally they all showed much repentance and readiness to be good Christians." (Diego de Landa, Relación de las cosas de Yucatán, Sec. 18. Vices of the Indians. Studies of the friars in the language of the country. Their teachings to the Indians. Conversions. Punishments of apostates).